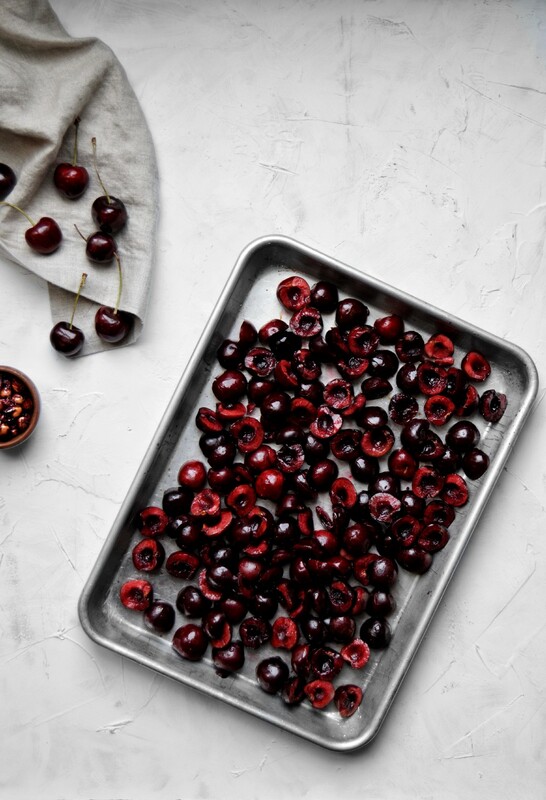 Growing up in Michigan, I never fully actualized the benefits of having access to incredibly fresh, juicy and rich cherries, for a large part of the summer. Subsequently, I also never realized how ridiculously therapeutic it is to stand in your kitchen, brew yourself an espresso, and proceed to pit a few pounds of said beautiful cherries for hours on end. (okay, maybe it’s not that therapeutic) I have, however, always recognized the inimitable delectation conjured up by flakey pie crust, a little sugar, a (lot) of butter, and a couple pounds of fresh stone fruit. In those special moments, whether everyone’s gathered around or you’re eating alone, nothing can surpass the desire for galette, pie or tart. No, not even cake — even this cake lover can admit that no cake come closes to the textural masterpiece and depth of flavor emanating from layers of sugary, butter crunch crust and roasted fruit, macerated in it’s own juices — in this case complimented by cognac and orange. While making a pie is already relatively simple and doesn’t come with anywhere near baked Alaska level complexity, a galette takes the throw-it-togetherness up a couple of notches. You simply make the crust (or unwrap it — no judgement zone), mix the fruit and flavorings and crimp the two together and bake until aromatic nirvana sets in — aka that moment when everyone in the house asks exactly what the hell you are baking and why it isn’t in their belly yet. These galettes are stupendously easy to throw together, and they don’t ask questions. Be it dinner party, existential crisis, holiday get together or moment of intense serendipity — these galettes have only the answer, and believe me when I say it’s the right one. I would chat you up more but it’s time to get down to the recipe. Can I use store bought crust? — Listen to me. Sometimes you’ve got to do what you’ve go to do — So I’ll let you use store bought crust just this once, on a solitary condition of paramount importance: You’ll try the homemade crust at least once. It’s super easy to make — just a few pulses in a food processor, a 15 second knead and you’re good to go (minus the 1 hour chill period, or as the adults call it, impromptu wine drinking time). What if I don’t have a food processor? — Here here. I have a food processor, I’ve had it for a long time. I’m also incredibly lazy when it comes to washing dishes and said food processor happens to have a lot of moving parts. If you don’t have a food processor, or are like me and would rather just do it by hand sometimes, use a pastry cutter, available from Target online. If you’re feeling splurgy and have no problem washing dishes, you can pick up the food processor I use here. Can I use sour cherries? — Yes yes yes! Just up the sugar to 1/3 of a cup (66 g). 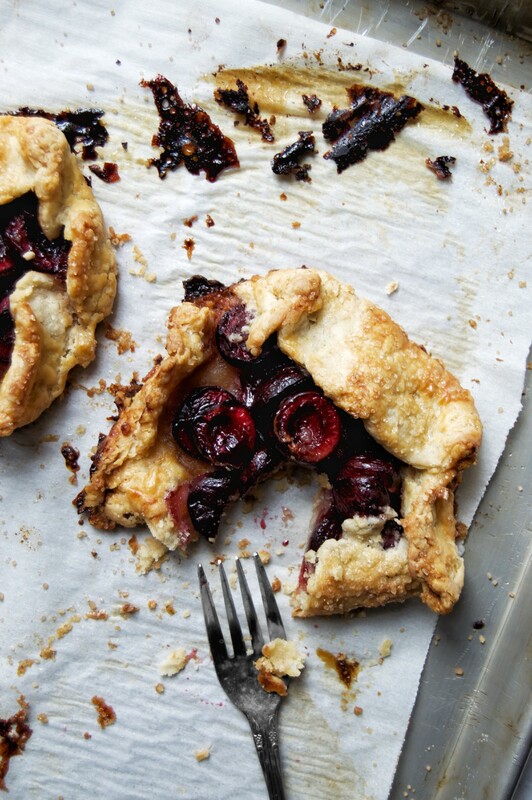 Trust me on this one, whether you decide to use sweet cherries, tart, or something in between, you and this galette are a match made in heaven. Can I make the galettes ahead of time? — Make. Assemble. Freeze on sheet tray, wrap snugly in plastic/foil and continue freezing for up to 2 months until ready to bake. Do not defrost, just add 10 extra minutes to bake time, or until edges are crispy looking and golden brown. Thank me later. How do I store the leftover galettes? — If you’re lucky enough to have leftover galettes, you can simply store them at room temp, wrapped in an airtight container, for up to 3 days. For more long term storage, wrap the galettes generously in foil/plastic wrap and freeze for up to 2 months. To reheat the frozen galettes, place them in a 350 degree oven until warm throughout. P.S. these storage instructions work for pies and tarts to. Biggest tip of them all: Keep a batch or two of this galette dough (pie crust) in the freezer at all times — simply move to the coldest part of your refrigerator and let defrost for at least 1 hour before using. In the bowl of a food processor, combine the flour, sugar, salt and orange zest and pulse to combine. Add the butter and pulse until the butter is evenly distributed in pea sized nuggets. Transfer the butter-flour mixture to a large bowl. Using your hands or a fork, slowly add the ice water until the dough begins to come together. Lightly flour a work surface or wooden cutting board. Empty the almost-dough out on to the surface and knead lightly one to three times, pressing gently to incorporate any loose bits of flour. Cut the dough ball into two halves, flatten each half to a 1" disk, wrap in plastic wrap, and chill for 45 minutes to 1 hour. Preheat oven to 375°F (190°C). Combine all of the filling ingredients in a large bowl, using a spatula or wooden spoon to mix, and then set aside to rest for 10 minutes, tossing occasionally. Remove the disks of crust from the refrigerator and lightly dust the work surface with flour. Cut each disk into four even pieces and roll each piece into a 5" round. 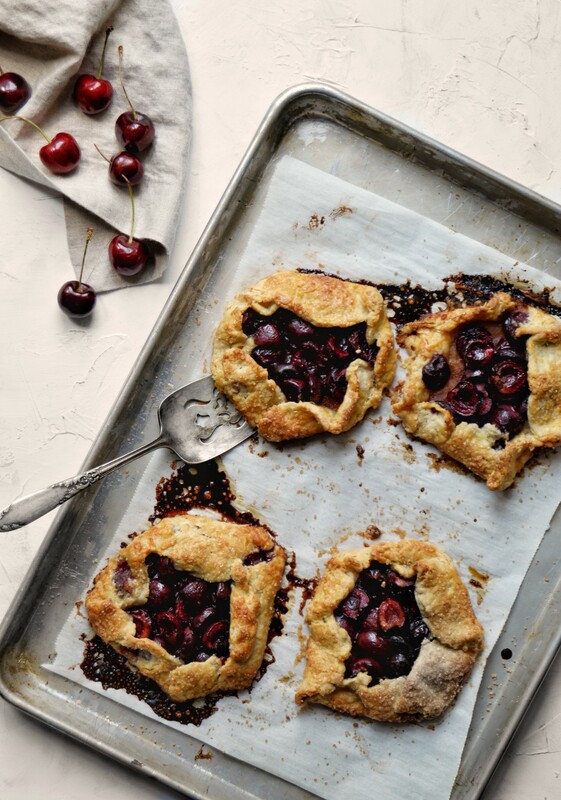 Working one crust at a time, while the others chill in the fridge, lightly brush around the edges of each crust round with the egg wash. Add a few tablespoons of the cherry filling and fold the edges of the dough up around the cherries, crimping to seal. Don’t worry about being perfect, these are called ‘rustic’ galettes for a reason. Repeat the egg washing, filling and crimping process with the remaining galettes, and transfer them to half sheets lined with parchment paper or silicon mats. You should fit no more than 4 mini galettes on each half sheet. Lightly brush the edges of each galette with egg wash, and generously sprinkle the demerara sugar all over each galette. Bake for 35 to 40 minutes, until crust is flaky and golden brown. Serve warm with ice cream or fresh whipped cream.